Winter in California is a great time to explore a unique place where the ocean meets the land–tide pools. Tide pools are an incredible ecosystem where animals and other organisms have adapted to a life of crashing waves, constantly changing water levels, exposure to sun, and potentially dry conditions. Tide pools are home to a plethora of fascinating organisms. Many of these organisms are invertebrates, or animals that do not have a backbone. From sea stars to neon-colored sea slugs, tide pools teem with life and diversity. Even the algae that helps feed or conceal small animals comes in all sorts of bizarre shapes, sizes, colors, and textures. 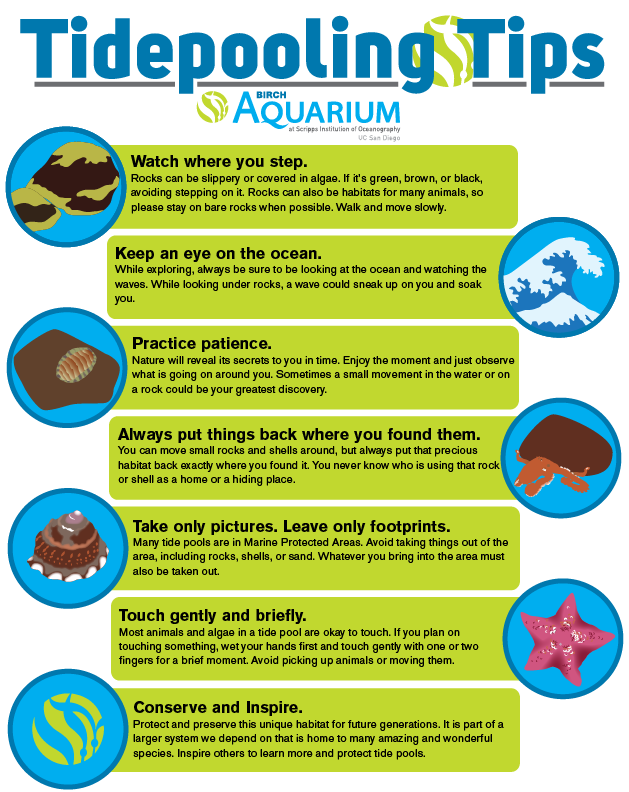 Here are some tips to having a wonderful tide pool experience that will help protect these magical places for future generations. Remember, it is up to us to protect and preserve the habitats and ecosystems we depend on. Practice these tips whenever you are out exploring the natural world.